I know it's only February, but the release of all the resort wear collections are making me crave a vacation. We don't have plans for any this year, just the standard trips back home to Ocean City over the summer, but either way the snow on the ground and high winds are making me long for some warm sun and sand between my toes. 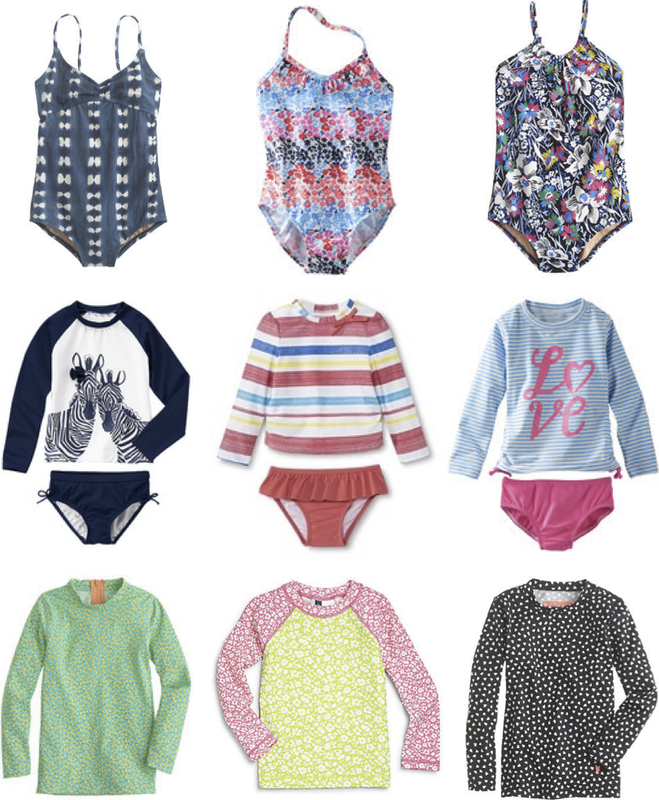 Of course, the majority of my warm weather unrest has come from all the adorable suits being released for girls. Confession time. I'm not really a fan of bikinis on baby or toddlers, more babies than toddlers, but even some of the toddler ones I see a bit much. I'm not going to stand on a soapbox about the over sexulization of young girls, if anything, it's driven more by my inner tomboy and the fact I didn't wear a two piece until I was 14 and even then it was a racer back top and boy short bottoms, but either way, it's not really for me. Of course, disclaimer, no judgement if others choose them for their little girls, I just would rather not worrying about applying sunscreen all over. Up until last year, Ashlynn only had one pieces. ADORABLE one pieces, because as fun as the mommy suit is above, no adult looks as a cute as a little diapered bottom babe in a bathing suit. However, lesson learned. TWO pieces are the way to go when changing diapers or potty training - two things I was doing last year with K and A last summer. On top of that, the rash guard is the best way to avoid missed sunscreen and unwanted sunburn, which our Irish skin is prone to. I loved the two piece I got Kenley last year, and again, BabyGap as knocked it out of the park with the mix print suits. However, I've seen some really cute suits all over. These Osh Kosh suits are perfect for coordinating sisters, and even look a bit like the gap styles. And just other adorable suits, I watching for sale time and swim lessons. I can't be the only one dreaming of warm weather, right?? Super cute ideas! I need to find a cute suit for my little, but there is no way to tell how big she will be by summer! Peanut is still in 3 month clothes and she's 7 months! Sooooo ready for summer - cute suits!!! I don't love bikinis on little ones either. I think the more coverage / protection from the sun, the better. I'm not a fan of one pieces for myself either, ever. I have a tankini and I hate the feeling of it when I get out of the water. They're just not flattering on me either. I do like the style and pattern of the one you showed though! I love that little zebra one! I definitely need to buy a 2 piece for Odette this summer because we'll probably still be potty training. I agree with you about bikinis for babies. Not really a fan. Rashguards are the way to go! That's what my daughter wore last year, and I loved not having to worry about her arms getting burnt. confession: i already bought blair TWO swim suits! do you guys have "carter's?" That's where I got them and they are darn cute. I'm DYING over the hanna anderson ones but oy $44?! i'm having a hard time pulling the trigger on that one. i am a little bummed though because they are one pieces which is a total pain when going potty. sigh. can't win! I thought I'd only like the rash guards on babies, but it's still so much easier once toddlers too!